A lot of discussions went on before the SV-Tower was built. 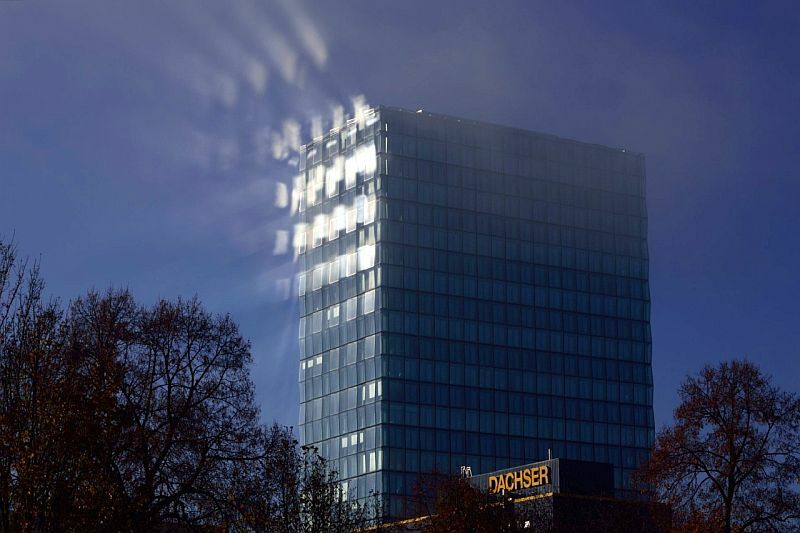 The headquarters of the publisher “Süddeutscher Verlag” was originally designed to be a 145 metres high 39-story building, but had to be limited to 100 metres (28 stories) after a popular petition in Munich. It was built between 2006 and 2008, when in September the SV employees rather unwillingly moved to their unloved new workplace. There were several discussions on the visual appearance of the new high-rise building. Some considered it as a boring square log, while others admired the special feature of its storefront. This storefront consists of a straight inward and a prismatic outward glazing. As the individual panes of the outer storefront are inclined to each other, they reflect landscape and sky alternately. So, depending from the incidence of light and the observer´s position, the appearance of the tower changes permanently. The inner glazing is normally not important here. Already in 2010, a friend showed me an unsharp photograph taken from his mobile phone, which showed sunrays in dispersing fog around the SV Tower. Although I pass the building almost every morning, it took five years until I could experience this phantastic light show myself. Hoping to be lucky this time, I took my camera with me on my way to work on November 3, 2015. The tour didn´t start very promising, as there was no fog around Munich. But when I reached the fairground east of the city, some fogbanks appeared, which already had started to disperse. Above them, the sun was shining, and so I got more and more excited. Should I really be lucky today? Short before the end of the A94 motorway, the SV Tower provided a stunning show with its reflected sunrays in the fog. Just a few hundred metres further I took an exit and went back on a road parallel to the motorway. From a parking lot I could watch and photograph the permanently changing sunrays. Intensity, direction and appearance of the rays constantly changed when I changed my position and the wafts of mist moved. And even the inner glazing played a role now, because the light caroming the straight inner glazing becomes reflected parallely. This caused an effect of “ghost windows” in the fog. When I started my observation at about 9.50 a.m., the fog was still relatively thick. At about 10.25 a.m., the fog had completely dispersed and the show was over.